Is site energy efficiency top of your agenda? From November Firefly is launching GLOW RFM™ for its Hybrid Power systems: a simple and easy to use cloud platform that provides reporting and management functionality to achieve energy and fuel savings. Reduction of CO2 and NOx emissions have become a key consideration for main contractors, with around half of all the UK’s carbon emissions accounted for by the construction and related industries. Temporary power is an important contribution to the overall emissions footprint of a construction project, particularly where there is a requirement for 24hr power. To achieve site energy efficiency, the combination of hybrid power systems alongside diesel generators provides the smart power solution. Providing significant CO2, NOx and fuel savings, hybrid power solutions offer silent overnight power to help meet the requirements under the Considerate Constructor Scheme along with helping to fulfil the UK’s emissions 2020 target. Easy to use dashboard reports from GLOW RFM™ can demonstrate the savings from using a hybrid power system to Site Teams and the Head Office of either a Plant Hirer or Contractor. 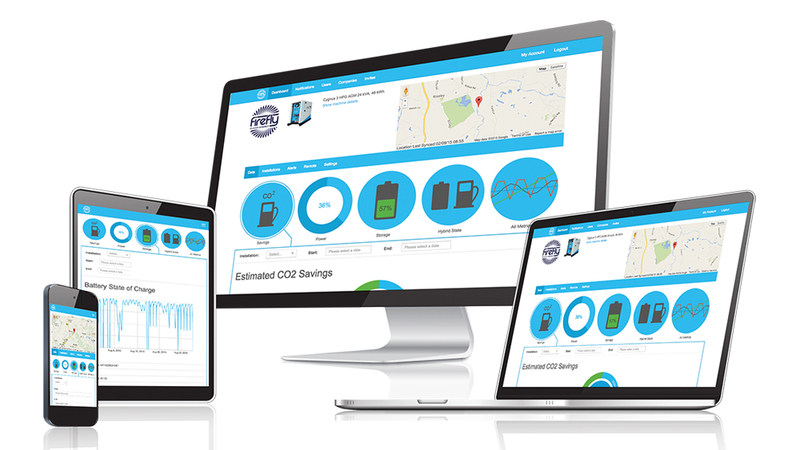 GLOW RFM™ makes managing assets simple by providing performance data via a PC, Mac, smartphone or tablet. It also allows remote field service teams to setup or configure a machine’s parameters, or fine tune and optimise efficiency as required. All Firefly power systems are backed up by a nationwide field service team.